Members of the Ahmadiyya Muslim Community Slough showed their support for the Royal British Legion at the weekend by raising money for the Poppy Appeal. Members from the community spend Saturday going door to door to raise much awareness of the Poppy Appeal in support of the Royal British Legion that covers Slough and Burnham. They were further asked to represent the Muslim faith at a Remembrance Sunday ceremony outside St. Peter’s Church in Burnham where the President of the Slough Ahmadiyya Muslim Community was given the honour of laying a wreath with the message of “Love For All, Hatred For None” for the fallen soldiers and comrades of war. Members from the Ahmadiyya Muslim Community Slough were asked to take part in the procession from the office of the Royal British Legion in Burnham town – through the main high street to the memorial outside the grounds of St. Peter’s Church – where the official laying of the wreath ceremony took place. The President for the Slough Ahmadiyya Muslim Community, Mobashir Tahir, then lay a wreath on behalf of the Community. Over the past 4 years, members of the Ahmadi Muslim Community have raised thousands of pounds for the Royal British Legion and just in the month of November have carried out poppy collections at Wembley Stadium and London’s Heathrow Airport. To date, they have raised more than £20,000. This year, Prime Minister David Cameron praised the Ahmadiyya Muslim Community – saying he was delighted to hear that more than 300 members of the Community would be supporting the Poppy Appeal by collecting donations at train stations and other places. Mobashir Ahmad Tahir, President of the Ahmadiyya Muslim Community of Slough said the membership felt honored that the Royal British Legion has asked them to represent Islam for the laying of the wreath for all the soldiers from around the world who took part in the great wars and died serving their country. “Our guiding principles are Loyalty, Freedom, Equality, Respect and Peace,” Tahir added. 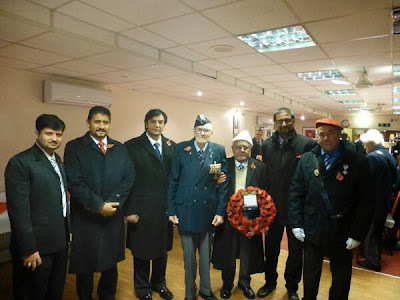 Share the post "Ahmadi Muslims of Slough Show Support for the Poppy Appeal, Raise Over £20,000"